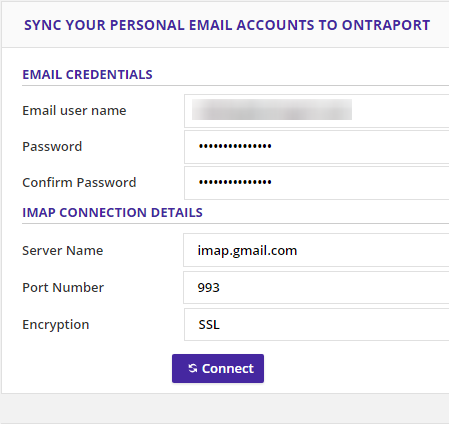 IMAP Settings can integrate your personal email accounts into ONTRAPORT. When configured, all email to or from your contacts is imported from that email account into the Contact's Contact History section. Note: Some Microsoft email clients send email in "RTF" (Rich Text Format) that is encoded, and will not display properly in the Contact Record. * Has multiple imap servers; check with the provider for the correct one for your account. May use TLS or SSL; test to determine which one is used. NOTE: These are sample settings only. Check with your email provider for your account settings. 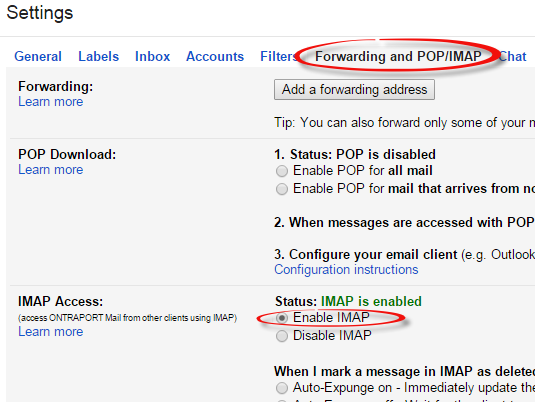 Log into your Gmail Account and make sure IMAP is enabled in the Settings > Forwarding and POP/IMAP > IMAP Access section. Visit http://www.google.com/accounts/DisplayUnlockCaptcha and sign in with your Gmail username and password. Go to https://myaccount.google.com/u/0/security and scroll down to the bottom. Make sure Allow less secure apps: ON is set. 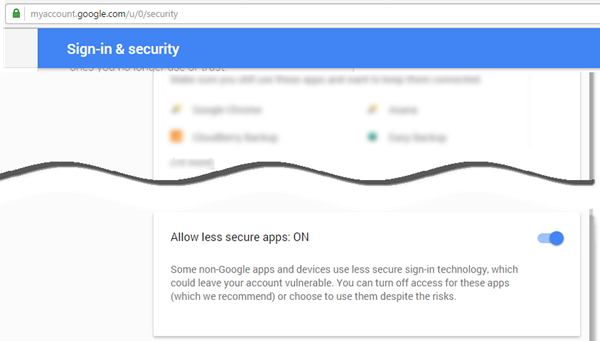 Verify that Access for less secure apps is set to Turn on at https://www.google.com/settings/security/lesssecureapps. Remain logged into your Gmail account and complete the configuration in ONTRAPORT. Remain logged into your email account and watch for an authorization pop-up message or email as you complete this process. Gmail and others require approval to allow IMAP connections. 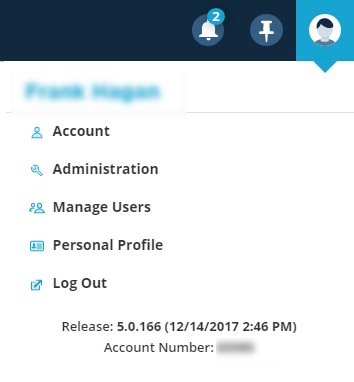 Click your profile icon at the top right and click Administration. Select IMAP SETTINGS under the Email section. Click the New IMAP Setting button. Fill in the IMAP details obtained from your email service provider and click Connect. Your email service's server may take up to two minutes to communicate back to ONTRAPORT. Wait for a "failed" message or a listing of mail boxes to appear on the lower half of the page. If the connection fails, try changing the Encryption setting. Most articles will say use TLS, but MicroSoft Outlook often uses SSL in spite of the published information. When you have successfully connected to your email account, ONTRAPORT will display a list of your email folders. Select the folders you want the IMAP Settings function to search. For most email clients like Outlook 365 this would include the Inbox and Sent Items. Do not select the INBOX for Gmail and Google Apps / G Suite accounts, as the IMAP process will fail. We recommend using the Important and Sent Mail mailboxes. They may be listed as [Gmail]/Important and [Gmail]/Sent Mail in your account. The Important mailbox contains all email from contacts you have corresponded with in the past and/or starred contacts in Gmail Contacts. Note that this limitation is generally unique to Gmail and Google Apps / G Suite email; other services are usually able to use the Inbox folder without an issue. To scan the mailboxes selected, click the Save button at the upper right of the screen to exit this email account. Upon exit ONTRAPORT will scan the mailboxes indicated. Add additional email accounts by repeating this process. Send an email from your connected email account to one of your contacts. Return to Administration > IMAP Settings and click on the Server Name in the IMAP Settings collection to open the configuration. After the configuration loads, click Save at the upper right. Upon exit, ONTRAPORT will scan the mailboxes you have specified. The IMAP Settings will update the Contact Records automatically every 12 hours. When connecting to your email service, remain logged in and watch for an authorization pop-up message. Gmail and others require approval to allow IMAP connections from ONTRAPORT. 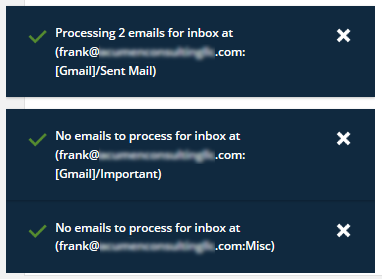 Email services limit the number and frequency of IMAP connections. IMAP connections are checked few hours but can take 12 hours or more. Allow time for a new message to be retrieved and inserted into the Contact'sCONTACT HISTORY section. For Gmail, we will no longer be scanning the inbox. Rather, we will be scanning specific Labels that are specified as the "Mailboxes" in ONTRAPORT. We recommend using the Important Mailbox as shown in step 5 under Configure the IMAP Settings in ONTRAPORT above. For Gmail or Gsuite email an error message that indicates ONTRAPORT cannot authenticate the IMAP server can be resolved by following the steps in the Google Troubleshooter and the Example Email Setup: Gmail section above. An error message specifying that an Application-specific password is required indicates your account requires two factor authentication. For Gmail or Gsuite check with the account administrator or visit Sign in Using App Passwords if you have administrator privileges.